This is a Character Training worksheet in excel, although I call it a training minigame because it's damn fun. (OK maybe not damn fun. But more fun than calculating training.) A few comments: Sadly, it does NOT run in Google docs, and I don't know GD's feature set well enough to know if it ever could. Costs are generally based on the estimable Kim Englund's excellent training costs table- listed on the 3rd tab. 2nd tab explains the various matrices used to generate the results. Having made too much training time available to my players early on, and them having lots of cash to blow, I spent a lot of time thinking about the cost/benefits of training. I couldn't argue much with the costs in Kim's table (far better than canon), I thought about "what are the other possible drawbacks of training hard constantly?" Injury: the consequence of training is, of course, the omnipresent chance of injury - strains, sprains, or worse. 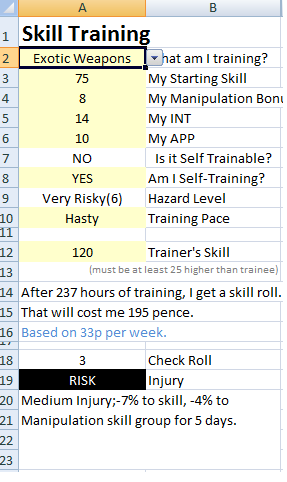 So I built this sheet based on risk levels for various skills. The odds of being injured are lower with a MUCH better skilled trainer, or training slowly. Of course, trying to train hastily, or self-train (for skills where that's possible) increase the risk of mishap. (Self training significantly reduces but doesn't eliminate the costs as well.) The second consequence is uncertainty: in real life, you never know of course when you're going to "get better"...just that you eventually, probably will. Thus this table. Select the skill to be trained (there are also generic categories like "Other, risky, cheap" for skills not listed) and enter your current skill, relevant skill category bonus, INT (makes training easier if you're smart), APP (makes training cheaper if you're pretty). It will tell you if you can train it by yourself, and you decide if you will do so, as well as if you are taking it slow & careful, normal, or hasty. It then tells you the risk level as a result. Yes, training high levels of climb all alone is damned risky. Finally, I didn't like the determinism and predictability of the RQ canonical method of "ok I have 40 hours to train, so I can train that for 37.8 hours and get a check, woo." Thus, this table turns the mechanism on its head. A player recognizes that "oh, I have some free time, I'd like to train" and tells their DM what they'd like to train in - the DM fills in the details, and gets a result like "After 16.5 hours, and a cost of 45p, you get a skill check." The DM has to tell them "ok after about a half week, you get a check." or "you've trained for a couple of days but haven't gotten a check when the Fire Nation attacks..." It also gives the result, if the DM wants to use it. The sheet will give a result based on the final risk level, and the consequences of a fumbled check. 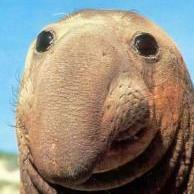 (Screenshot above.) These can be severe...my suggestion is that when training highly dangerous things, serious thought be given to training slowly. Ultimately, the player has to make realistic decisions, recognizing if they're extremely skilled in something, it can take WEEKS of training to get a check. Will they really have weeks to spend? Only their DM knows... Let me know if you have questions.